As we learned in solids, liquids, and gases all matter exists in certain states or phases. Water can be liquid water, solid ice, or gas vapor. It's still all water, however, and made up of molecules of 2 hydrogen atoms and 1 oxygen atom (H2O). When a solid turns into a liquid it is called melting. There is a temperature at which this happens called the melting point. As the energy in the molecules increases from a rise in temperature, the molecules start moving faster. Soon they have enough energy to break free of their rigid structure and start moving around more easily. The matter becomes a liquid. The melting point for water is 0 degrees C (32 degrees F). When the opposite happens and a liquid turns into a solid, it is called freezing. When a liquid becomes a gas it is called boiling or vaporization. Again, at a certain temperature called the boiling point, the molecules will gain enough energy to break free and become a gas. The boiling point for water is 100 degrees C (212 degrees F). When the opposite occurs and a gas becomes a liquid, it is called condensation. Evaporation is liquid becoming a gas that happens only on the surface of a liquid. Evaporation doesn't always need a high temperature to occur. Even though the overall energy and temperature of a liquid may be low, the molecules on the surface that are in contact with the air and gases around them, can be high energy. These molecules on the surface will slowly become gases through evaporation. You can see evaporation when water on your skin dries or a puddle in the street slowly goes away. Scientist use the term "standard state" to describe the state an element or substance is in at "room conditions" of 25 degrees C and one atmosphere of air pressure. Most of the elements, like gold and iron, are solids in their standard state. Only two elements are liquid in their standard states: mercury and bromine. Some of the elements that are gases in their natural state include hydrogen, oxygen, nitrogen, and the noble gases. 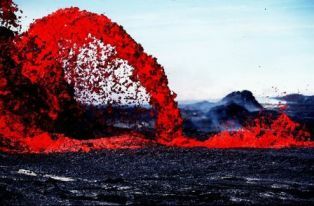 When rocks get really hot they turn into a liquid called magma or lava. Gas can be turned into a liquid through pressure. By squeezing all the gas molecules tightly together a gas can become liquid. We use natural gas in our homes in its gas state, but when it's shipped in ocean tankers it's shipped in a liquid state to save on space. Mercury has the interesting properties of being both a metal and a liquid in its standard state.